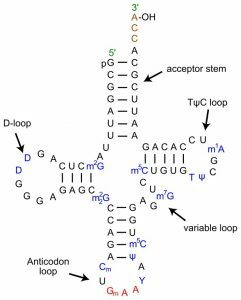 The anticodon is the three-nucleotide sequence of transfer RNA (tRNA) which corresponds to the codon present on the messenger RNA (mRNA). Each anticodon is a series of three nucleotides, either adenine (A), guanine (G), uracil (U), and cytosine (C). Each anticodon exists in a loop of transfer RNA. This allows the anticodon to be presented to the codon in a ribosome. The full process of how and anticodon functions is below. In order to produce proteins from DNA, a number of steps must occur. First, the DNA must be read and translated into RNA. Then, this RNA molecule is processed into mRNA, and transported out of the nucleus. The mRNA finds its way to a ribosome, the protein producing complexes found in the cytosol and attached to the endoplasmic reticulum. 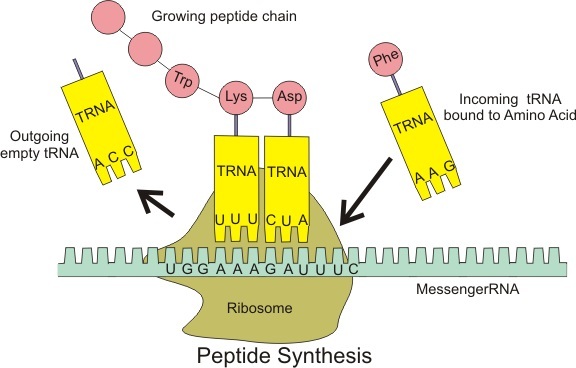 To assemble proteins from this mRNA, the ribosome must match amino acids to the genetic code. This is the process of translation, switching the genetic code to the protein code. The mRNA is read in units of three nucleotides, known as codons. Free amino acids, floating around within the cytosol, are bound to small molecules called transfer RNA (tRNA). On each tRNA is an anticodon. The anticodon is the complimentary match to the mRNA. The ribosome recognizes when an anticodon matches the mRNA, and binds the associated amino acid. This can be seen in the image below. 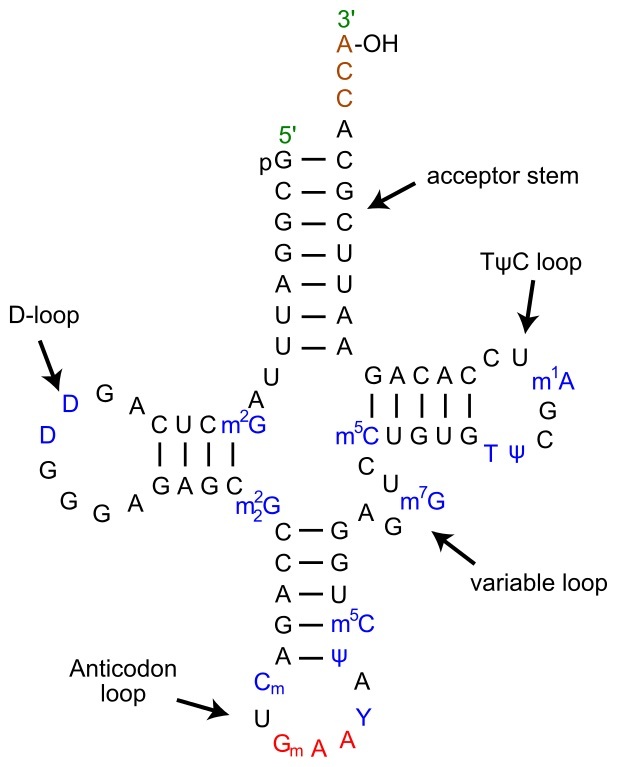 After the codon and anticodon are matched, and the peptide bond is formed, the anticodon is discarded with the tRNA. These anticodons are recycled, and added back onto free amino acids. This is known as the process of aminoacylation. Through this process, anticodons serve to identify amino acids, and correlate the 4 character genetic code to the 21 amino acids needed to build proteins. Nucleotides within RNA also undergo base pairing, in which two complementary amino acids form hydrogen bonds. Within the ribosome, this briefly locks the anticodon to the codon. If the wrong anticodon is in place, the ribosome will reject the tRNA and associated amino acid. In this way, the ribosome is “reading” the mRNA to produce a protein. In RNA language, A base pairs to U, while C base pairs to G. An easy way to remember is to think about the tall skinny letters together, and the round fat letters together. Though each anticodon is only a sequence of three nucleotides, these nucleotides are bound in a specific formation within the tRNA. Seen below is a tRNA molecule. The acceptor stem binds to the appropriate amino acid. The anticodon loop holds the anticodon in an exposed position. The anticodon is seen in red. Remember that there are many anticodon sequences. Some amino acids may have more than one anticodon sequence, and as such more than one codon. The other loops on the tRNA molecule remain the same, and are there to ensure the anticodon is properly recognized by the ribosome. Each anticodon is programmed genetically. In our DNA, as with all eukaryotes, there are many genetic sequences which do not contain codes for proteins. Instead, these short sections can be copied into RNA by an RNA polymerase III enzyme. This RNA transcript, when folded back on itself, develops the unique loops of tRNA. These molecules are created and exported from the nucleus. Each anticodon sits at the exact bottom of the lowest loop. The tops of the tRNA have specific charges and properties, which can be recognized by individual aminoacyl tRNA synthetase enzymes. Each amino acid has a corresponding enzyme, programmed by a unique gene. These enzymes are highly specific for the amino acids and tRNA they select, ensuring that the genetic code is never broken. As an anticodon, you would start your journey in the cell when you were transcribed into RNA. An enzyme responsible for making tRNA scours the DNA. When it finds the proper promoter regions, it begins the transcription. As an anticodon, you make up only a small part of the RNA. Three nucleotides, to be exact. The enzyme works quickly, assembling a chain of nucleotides into RNA. Finally, it reaches you. The enzyme reads the DNA, and adds a corresponding nucleotide base to the growing RNA chain. Two more times, and the anticodon is complete. The enzyme continues reading the gene, until an entire tRNA is completed. As the enzyme releases the tRNA into the cytosol, it folds back onto itself, forming a series of loops. Evolution has selected that the anticodon rests at the very bottom of the furthest loop from the stem. You drift through the cell’s interior, until you run into an aminoacyl synthetase enzyme. 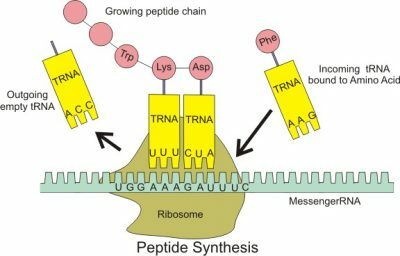 This enzyme grabs onto the tRNA, and adds it to the appropriate amino acid. Now bound to an amino acid, the anticodon is part of a large, multi-molecule complex which heads to a ribosome. As the tRNA and amino acid reach the ribosome, it is set in the proper orientation for the anticodon to be presented to the mRNA. If the anticodon matches the codon is the mRNA, the molecule complex is drawn into the ribosome. The anticodon forms hydrogen bonds with the mRNA. This changes the shape of the molecules slightly, causing a change in the ribosome. The ribosome presses the two amino acids it has bound together, and they are bonded. In doing so, the tRNA is detached from the amino acid. In the third portion of the ribosome, the anticodon is stripped from the codon, so both can be reused. The mRNA can be translated multiple times. The anticodon will go back through the process of aminoacylation, and get another free amino acid. Since RNA breaks down over time, new anticodons and tRNA must be continually transcribed from the DNA. 1. What is the difference between a codon and an anticodon? 2. Here is an anticodon: UAG. Which of the following is the corresponding codon? 3. Humans have over 200 versions of tRNA genes in their genome. Each has a different anticodons. With only 21 amino acids, why so many anticodon genes?